There are some wedding invitations that are so intricate and designed to within an inch of their life that they can leave you struggling to know if it is a wedding, a rave or an opening of a new store you are going to. If that is what the happy couple is looking to create, then that is fine, but there are also times when you should be looking for something a bit simpler. The Sparkling Hearts wedding invitation is one of the simpler designs; in fact, the simplistic nature of the design will be enough to stop you in your tracks. 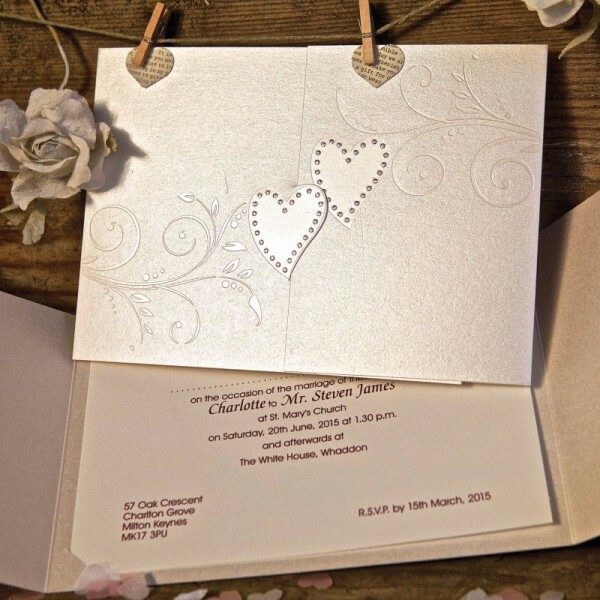 The invitation features two interlinked hearts that are finished with a silver emboss. That is all virtually all you need to say about the upcoming wedding but the two hearts actually hold the invitation in place and when they are opened up, all of the relevant details about the wedding are presented on the inner card. This is a wedding invitation that requires a small bit of assembly but when the finished design has such an impact, while still providing all of the information that a person needs to know about a wedding, it is well worth the effort. This is an understated card that is ideal for couples that are confident in their love and don’t need to shout things from the rooftops, they just want people to know where and when they can join in the celebrations. With a range of additional accessories on offer, there is an opportunity to spread the word and communicate with friends, family and guests in a stylish manner. Order from Bride & Groom Direct.